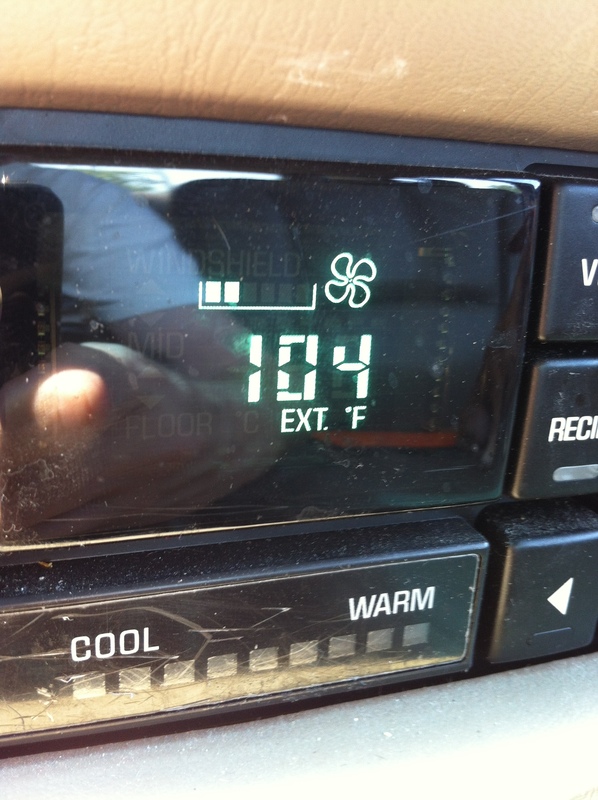 Excessive Heat Warning for West Alabama – Saturday 1:15 p.m. 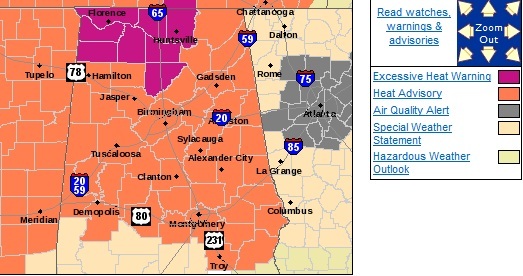 The National Weather Service has issued an Excessive Heat Warning for all of Central Alabama until 9 pm Sunday. An intense heat wave with near record high temperatures will continue with temperatures and heat indices climbing to potentially dangerous levels across Central Alabama. Temperatures – 100 to 106 degrees today and 101 to 105 Sunday afternoon. With that in mind, the all time record high in Tuscaloosa is 107, we could approach that today. * Heat index values – around 110 degrees Saturday and Sunday afternoon. * Impacts – prolonged exposure to this heat can be dangerous if the proper precautions are not taken. An Excessive Heat Warning means that a prolonged period of dangerously hot temperatures will occur. Take extra precautions if you work or spend time outside. When possible, reschedule strenuous activities to early morning or evening. Know the signs and symptoms of heat exhaustion and heat stroke. Wear lightweight and loose fitting clothing when possible and drink plenty of water. To reduce risk during outdoor work the Occupational Safety and Health Administration recommends scheduling frequent rest breaks in shaded or air-conditioned environments. Anyone overcome by heat should be moved to a cool and shaded location. Heat stroke is an emergency, call 9-1-1. All areas around Central Alabama have the potential to break record highs today. 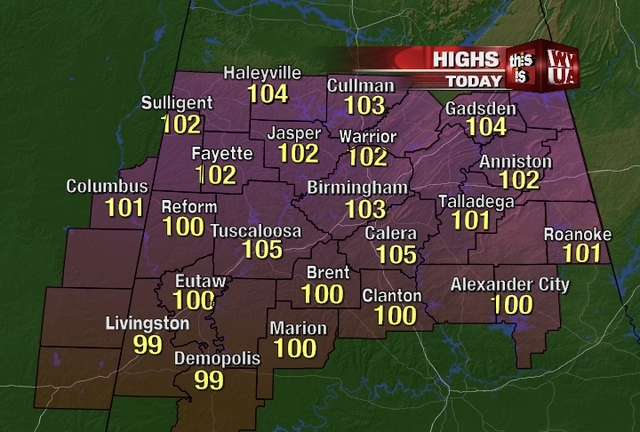 Tuscaloosa’s previous record was 103 set back in 1954, we are already forecast to hit 106 today. It may be a heat wave for the record books. Stay cool out there. I’ll have your updated Home Team Forecast tonight on WVUA News at 10. Watching the Tropics – Invest 97 – Saturday 1 a.m.
Once again we have our eyes down on the tropics. The National Hurricane Center is watching a new tropical wave called Invest 97. The wave is located about 750 miles east of the Windward Islands and is moving west at about 10 to 15 mph. The area marked ‘2’ above is Invest 97. Area 1 is the remnants of Debby and area 3 is an area of disorganized showers that has little chance of becoming organized, at this time. Now back to Invest 97. The associated thunderstorm activity hasn’t changed much in organization over the past few hours, due to drier air in the vicinity of the system. As of the 1 a.m. update the National Hurricane Center is giving this system a 20 percent chance of becoming a tropical cyclone in the next 48 hours. The latest forecast models tend to disagree. Above you can see the latest models forecasting intensity. Given that the most recent models were released about 5 hours ago. All but two models indicate that the system, will become a Tropical Storm within the next 48 hours. Most have it occurring between 7pm Saturday and 7am Sunday. These models also indicate that the system, over the next five days, will peak in intensity Monday night before losing some strength. The next map may help explain why. From Monday night on the model data is fairly inconsistent. As you see above, the cone of uncertainty encompasses the entire Caribbean Sea. And this will continue to be the case until the storm can form and get caught in a steering current that will determine it’s eventual path. As you can see there are some solutions that will bering the system, into the Gulf of Mexico, but that is still a week or more away. We will of course keep you up-to-date on the tropics and Invest 97. If there is more to share, I’ll be sure to do that here and later on WVUA News at 10. Until then, have a great Saturday and stay cool! Check out the highs this afternoon across our area. Tuscaloosa reached 105, which is 2 degrees shy of our all time record high of 107. This is dangerous heat that we don’t deal with very often. We will continue to see temperatures like this through Sunday and Monday. Skies will remain mostly sunny through Sunday. As the upper air ridge weakens some, temperatures will gradually drop. Highs will fall into the 98 to 102 degree range on Monday through next Friday. The risk of scattered storms will also increase early to mid portion of next week. We will have to keep an eye on any storms that develop northwest of our area on Tuesday through Friday, as they have the risk of growing into an MCS or Mesoscale Convective System. It will not be an all day or night rain at all, but there are signs of atleast some risk of rain. While storms should remain isolated to scattered next week, there is a small risk of a complex of storms moving into the area, so stay updated on any forecasting changes. Skies will remain partly cloudy next week. 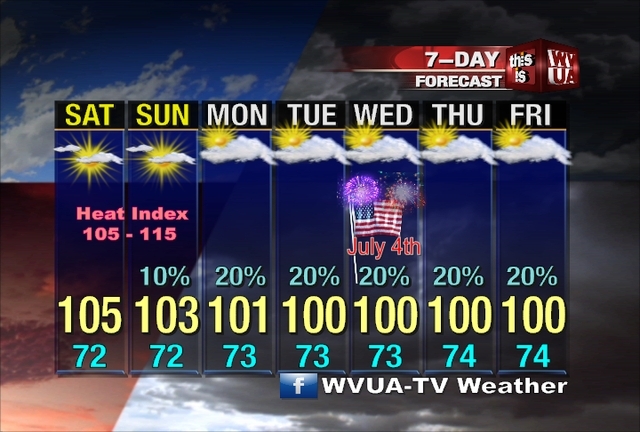 Here are some heat stats put the National Weather Service office in Birmingham put together. Much of the area is breaking records, and that will continue through Monday. * TEMPERATURES…ACROSS CENTRAL ALABAMA WILL CLIMB TO AS HIGH AS 104 DEGREES SATURDAY AFTERNOON. * IMPACTS…PROLONGED EXPOSURE TO THIS HEAT CAN BE DANGEROUS IF THE PROPER PRECAUTIONS ARE NOT TAKEN. A HEAT ADVISORY MEANS THAT A PERIOD OF HOT TEMPERATURES IS EXPECTED. TAKE EXTRA PRECAUTIONS IF YOU WORK OR SPEND TIME OUTSIDE. WHEN POSSIBLE…RESCHEDULE STRENUOUS ACTIVITIES TO EARLY MORNING OR EVENING. KNOW THE SIGNS AND SYMPTOMS OF HEAT EXHAUSTION AND HEAT STROKE. WEAR LIGHT WEIGHT AND LOOSE FITTING CLOTHING WHEN POSSIBLE AND DRINK PLENTY OF WATER. TO REDUCE RISK DURING OUTDOOR WORK THE OCCUPATIONAL SAFETY AND HEALTH ADMINISTRATION RECOMMENDS SCHEDULING FREQUENT REST BREAKS IN SHADED OR AIR CONDITIONED ENVIRONMENTS. ANYONE OVERCOME BY HEAT SHOULD BE MOVED TO A COOL AND SHADED LOCATION. HEAT STROKE IS AN EMERGENCY…CALL 9 1 1. Good Friday afternoon to you! We are dealing with a classic early summer heat wave across the deep south. A very intense summer ridge has moved into Alabama, and this is producing very hot and dry weather. Reports of forest fires are breaking out over parts of Tuscaloosa County and Alabama. You’ve got to use caution outdoors due to the heat and no burning due to the dry conditions. There are two major concerns through the weekend, one is for heat illness, and two is for forest fires. Heat index values are as high as 110 in parts of west and central Alabama. With air temperatures and heat index values this high, you’ve got to use caution. The ridge will continue to impact our area with triple digit heat and sweltering heat indices. Try to stay indoors during peak heating hours. If you have to work outdoors, drink lots of water and take lots of breaks. Be sure to avoid caffeinated drinks and alcohol due to the risk of rapid dehydration. Temperatures will top out between 103 and 106 on Saturday and Sunday as well. The all time record high for Tuscaloosa is 107. Temperatures aren’t forecasted to reach that level, but don’t be shocked if we get very close to it. The upper air ridge will start to break down a bit early next week, and that will allow for temperatures to drop a few degrees and scattered afternoon storms to develop across the area. Monday through Thursday will feature partly cloudy skies with the risk of scattered storms. At this point, rain chances are low, but changes are possible. Some spots will deal with a nice cooling shower next week, while other spots will remain hot and dry. Temperatures will top out between 98 and 101 on Monday through next Friday. Overnight lows will fall into the lower to middle 70s each night through next week. Wednesday is looking hot, with the risk of a few afternoon storms. If you have plans to the river or lake on the 4th, keep an eye out to any afternoon storms that develop. If you hear thunder, go indoors until the storm passes. The rain chance is at 20%, so most spots will remain rain free on Wednesday. The beach forecast is looking great over the next few days. Highs will reach the lower to midle 90s along the Alabama and northwest Florida Gulf Coast. The risk of rain over the weekend and early next week is less than 20%, so the beach trip is looking good. Water temperatures range in the lower to middle 80s along the northern Gulf Coast. Boy Is It Hot Outside! – Friday 5 p.m.
Well it is officially summer in the South. I ventured out today to grab a bite to eat at about 3:30p and this is what my car said. It’s very hot and it is fairly dry outside. Humidity values are below 40 percent in most places and it has been dry and hot for several day so the ground is drying out. We are in fact starting to get reports of forest fires in parts of Tuscaloosa County and other places around Central Alabama. This is not a good time to be outside burning. With little chance for substantial rainfall, any fire that get out of hand could spread quickly and lead to a larger fire. While conditions are like this just take it easy and stay inside. Remember to check on your pets and give them lots of water. Richard will have your full Home Team forecast on WVUA News at 5, 6, and 10. I’ll see you tomorrow on WVUA News Weekend. Good Friday Morning to you! The map above shows the watches, warnings and advisories across our area. All of central and west Alabama is under a heat advisory, while much of north Alabama is under an Excessive Heat Warning. Temperatures across all of our area will top out between 102 and 106 this afternoon. As of 11am, we are getting close to 100. Look for temperatures to climb through 4pm, then gradually start to fall off after 5pm. Due to high dewpoints, heat index values are over 100 now and will reach the 106 to 112 degree range this afternoon. Please use caution when outdoors today through Sunday. The extreme heat will continue all weekend. Drink lots of water, take breaks and stay in the shade or indoors when possible. Also, try to get yard work done early in the morning and late in the evening. Skies will remain mostly sunny through the entire weekend. The risk of rain is very low through Sunday, so don’t count on any rain to cool you off. Scattered afternoon storms will become possible on Monday through Thursday, as the upper air ridge weakens some. Highs will still remain close to the 100 degree mark through the middle of next week. Look for lows to fall into the lower to middle 70s. As temperatures increase over the weekend, it’s possible than an excessive heat warning is extended southward into central Alabama. * TEMPERATURES…ACROSS CENTRAL ALABAMA WILL CLIMB TO AS HIGH AS 102 TO 104 THIS AFTERNOON AND AS HIGH AS 105 DEGREES SATURDAY AFTERNOON. AN EXCESSIVE HEAT WARNING MEANS THAT A PROLONGED PERIOD OF DANGEROUSLY HOT TEMPERATURES WILL OCCUR. THE COMBINATION OF HOT TEMPERATURES AND HIGH HUMIDITY WILL COMBINE TO CREATE A DANGEROUS SITUATION IN WHICH HEAT ILLNESSES ARE LIKELY.TAKE EXTRA PRECAUTIONS IF YOU WORK OR SPEND TIME OUTSIDE. WHEN POSSIBLE… RESCHEDULE STRENUOUS ACTIVITIES TO EARLY MORNING OR EVENING. KNOW THE SIGNS AND SYMPTOMS OF HEAT EXHAUSTION AND HEAT STROKE. WEAR LIGHT WEIGHT AND LOOSE FITTING CLOTHING WHEN POSSIBLE AND DRINK PLENTY OF WATER. 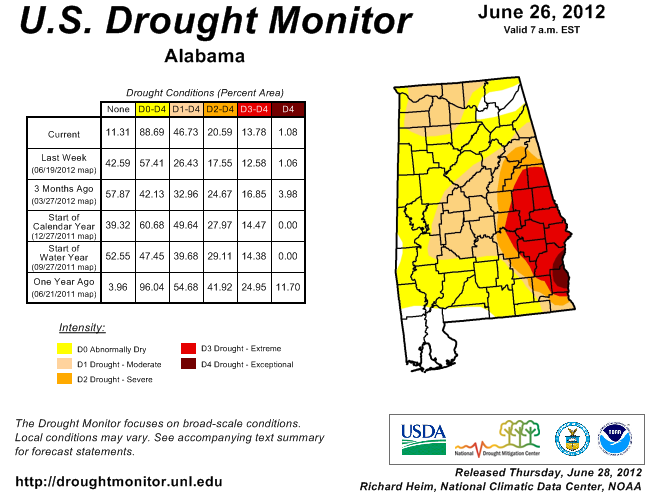 The recent hot and dry conditions across Central Alabama has resulted in some westward expansion of drought conditions in Central Alabama. The latest U.S. Drought Monitor indicates exceptional drought exists to the right of a line from near Texasville to just north of Eufaula. Extreme drought is found to the right of a line from near Brundidge to Meadville to Wetumpka to north of Alexander City to Barfield to Napoleon. Moderate to severe drought is found to the right of a line from Linden to Brookwood to Birmingha to Ashville to Hokes Bluff to Centre. Remaining areas are indicated to be near normal or abnormally dry.